I've always seen dinosaurs walking around my neighborhood. Good to confirm it wasn't just all in my head. For a second there I thought I might be crazy! Of course it also wouldn't be a Jurassic World game without freaky hybrids. In this game you can use the DNA of two creatures to make monstrous hybrids. Unlike in the last game where you sacrificed your two original creatures to make a hybrid, now you don't lose your original parent creatures when you create a hybrid. (This is nice since I became rather attached to my Einiosaurus.) Sometimes you can even combine hybrids you already made to create even weirder hybrids that are a combination of three creatures, instead of two. To be fair, Indominous rex, from Jurassic World, was a combination of a Tyrannsoaurus, Velociraptor, Majungasaurus, cuddlefish, and a frog. So think of that before you start whining about triple hybrids in this game. Science Fiction! Here's what comes out when you combine a ceratopsian with a pseudosuchian. That's a thing you know now! That's all well and good, but what about something for the pure of heart paleontology lovers? Is this a game for them, too, or just casual Jurassic World fans? Well I downloaded the game, have been playing it for a bit over a week now, and kept this question in mind the whole time. Let's dive in! First thing I want to bring up right off the bat that is that all the prehistoric animals in this game are referred to as a whole as "creatures" in this game, and not "dinosaurs". 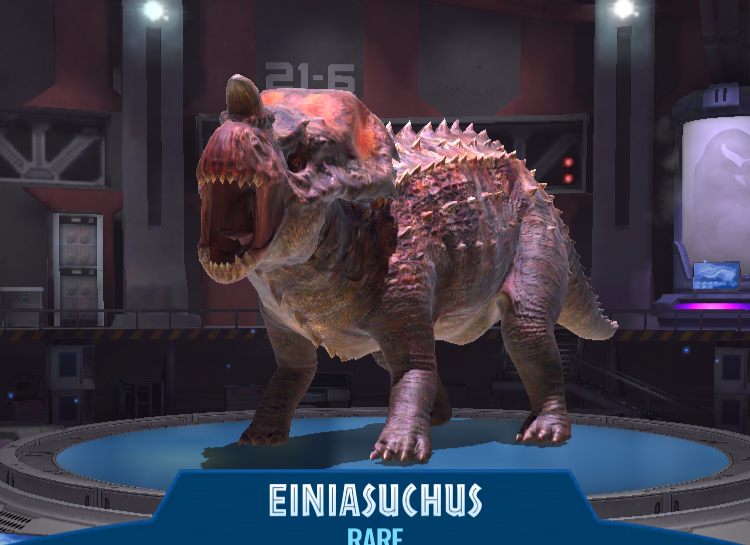 This is appreciated since there are more than just dinosaurs to collect in this game, including plenty of pseudosuchians, synapsids, and amphibians. It's a subtle detail, but it's also one that makes an impact on me. Countless times I have seen games, toys, shows, movies, and any other kind of entertainment about dinosaurs and other prehistoric life refer to to the whole pool of subjects as "dinosaurs". This is because the term, "dinosaur" is more charismatic and fun than "prehistoric animals". I suppose Jurassic World has enough popularity going for it that it can afford to tell it like it is in this regard and not lose any downloads. Good on them. So how about the accuracy of the creatures? The Jurassic Park/World franchise is notorious for making mistakes on accuracy, and sometime straight up actively choosing less accurate designs for the sake of what hey think is better entertainment. With that in mind I will say up front that any creature that has been featured in any of the films appears in this game true to the way it did on the big screen, accurate or not. 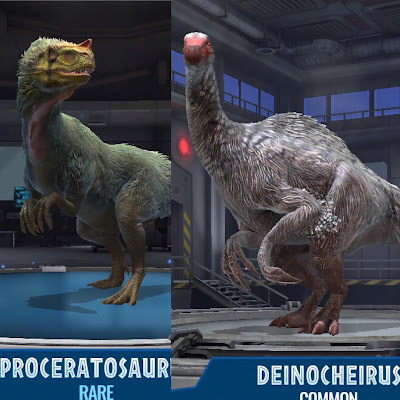 So Dilophosaurus has a frill and spits poison, Velociraptor is featherless, Apatosaurus' neck is too thin...all the same inaccuracies in the movies that paleontology nerds, like myself, have been pointing out at nausea for the past twenty five years, are also in this game. They do attempt to acknowledge the fact the Velociraptors are over-sized in the flavor text...that's something! Right? This fixes everything. All you nerds can stop whining now. THAT BEING SAID....when it comes to animals that are not featured in the films, and therefore don't need to uphold any sort of image for recognition sake...some (not all) are actually pretty darn good! I said something similar in my review of the last mobile game about Jurassic World, two years ago. This game has actually improved further, having significantly more passable models in this newest game. Let's start with the most popular instigator of accuracy debates, feathers. Almost every theropod, specifically coelurosaurians, that we know almost certainly had feathers in life, have feathers in this game. I'm not talking about the lazy half-attempt few feathers on the head or arms either. We're talking fully feathered dinosaurs here. Creatures like Deinocheirus, Proceratosaurus, Utahraptor, and even some of the tyrannosaurids (on which feathers are debatable even scientifically speaking), like Lythronax, sport full coats of plumage. Plenty of dinosaurs in this game have feathers. Frustratingly enough, like I said above, Velociraptor, which has possibly the strongest evidence for feathers in life, is portrayed just like it is in the films in all its naked glory. 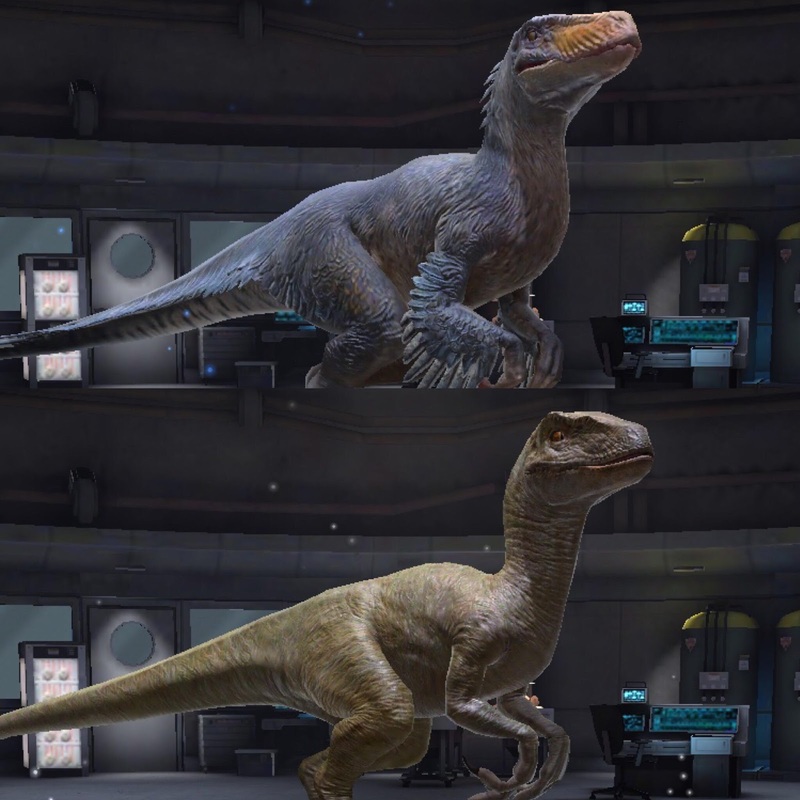 I find this particularly amusing when you look at it next to other dromaeosaurids in the game that are portrayed fully feathered. 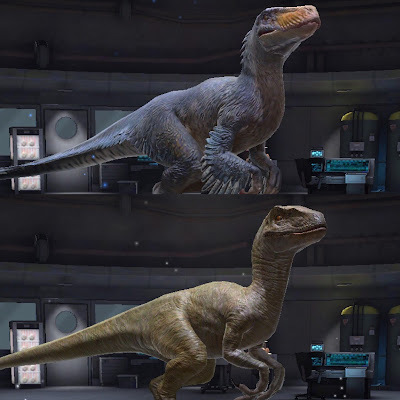 (top) Utahraptor is appropriately feathered (with a few minor detail mistakes) but sacred Velociraptor (bottom) is the same old naked it's been since the 1993. Sigh. In general their large theropods have improved. Dinosaurs like Suchumimus (which is based on paleoartist, Julius Cstonyi's artwork for the Jurassic World website over two years ago), Megalosaurus, Majungasaurus, and Gorgosaurus are almost totally safe from criticism from me. The only really glaring problem is that all their wrists are still wrong, with their palms facing down, instead of inwards. But the the models of these large meat-eaters, especially when compared to those of the same taxa in the last Jurassic World game, are much more accurate. (top) The pretty terrible excuse for a Megalosaurus from the Jurassic World mobile game, released in 2015, which looks like a warped Tyrannosaurus model. 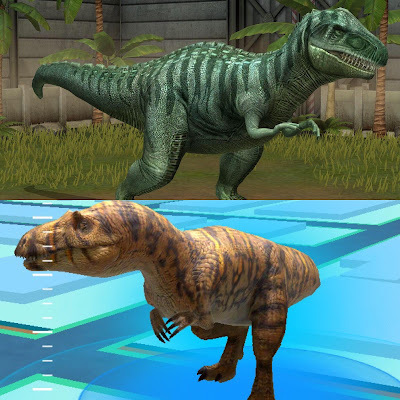 Compare it to (bottom) the significantly better Megalosaurus in the new Jurassic World Alive game, which is much more accurate. This is just one example. Many of the large theropods are much more accurate compared to the last game. Some of the ornithopod dinosaurs are also really well done. The one that I was impressed the most by was Edmontosaurus. I love how the beak actually angles down beyond where the skull's beak would end, which is consistent which what we now know based on a nicely preserved specimen of this dinosaur, now on display in Los Angeles, that shows the keratin beak on top of the bone, proving that it didn't have simply a flat "duck bill". This is something lots of portrayals of this animal (even scientific ones) get wrong. 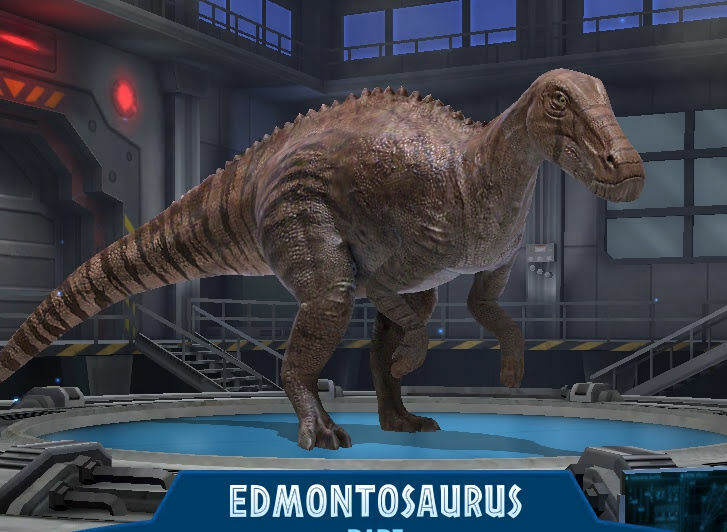 The Edmontosaurus in this game also has the row of raised scallop-pattern scales running down the back which is also consistent with known hadrosaur fossils. Nice! Of course there are still some models that are just as bad as they were in the last game...or just bad on their own. The amphibians, like Diplocaulus and Koolasuchus, or some of the pseudosuchians, like Nundasuchus and Postosuchus, come to mind. The sauropods, ceratopsians, and thyreophorans, while not flat out horrible, all suffer from somewhat subtle inaccuracies in their general anatomies. At the end of the day, despite how frustrating it is, Jurassic World isn't trying to be scientifically accurate, especially if it gets in the way of what they think will get them better ratings and more money. That being said, after looking at this game, it is evident that at least some people on creative design team definitely did their homework about these animals and applied what they learned where they could. This attention to detail is a refreshing oasis of fleeting scientific accuracy in a desert of ignorance. This game isn't going to fix everything, but it has its positive aspects that the latest movies don't. 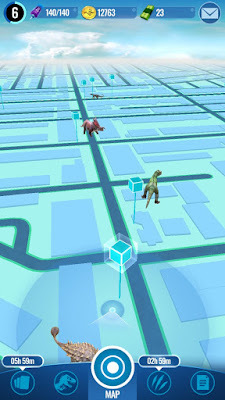 Just like with Pokemon Go, it encourages people to go outside and interact with their surroundings, plus it can also help some newer paleontology fans of all ages learn the names of some creatures they may not have known about before.